I was listening to the latest edition of 'The Quiet Village' podcast - a must for tikiphiles - when I heard a catchy little ditty. It was the theme from the original 1958 movie, 'The Blob'. be careful of the blob. What a fun little tune for something so terrifyingly fearsome.﻿ I'm ashamed to say I've never seen this classic movie and have now made arrangements to do so this Halloween. Here is a trailer for 'The Blob' (starring Steve McQueen and a cast of exciting young people) - they play this trailer at the drive-in in Grease. 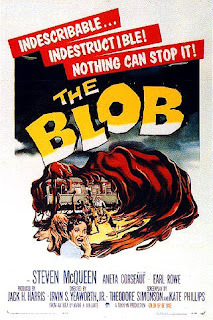 Included is it's 1972 sequel, 'Son of Blob' (which looks absolutely hilarious). Y'know, somehow I've managed to miss this gem, too. I really dig that hip intro song! And you're so right about the strange juxtaposition between such a light, upbeat ditty and the movie's actual sinister subject matter... I guess it's a HUGE clue NOT to take the flick very seriously. But, then, how could anyone? ?